If you have purchased a laptop running Windows 8 recently you may have noticed that it may not contain a small label on the back side or battery compartment listing the operating system's product key. The question that should come up at this point is how you are going to reinstall the operating system without the product key. The answer is however fairly simple. Device manufacturers are embedding the product key in the BIOS of the motherboard. 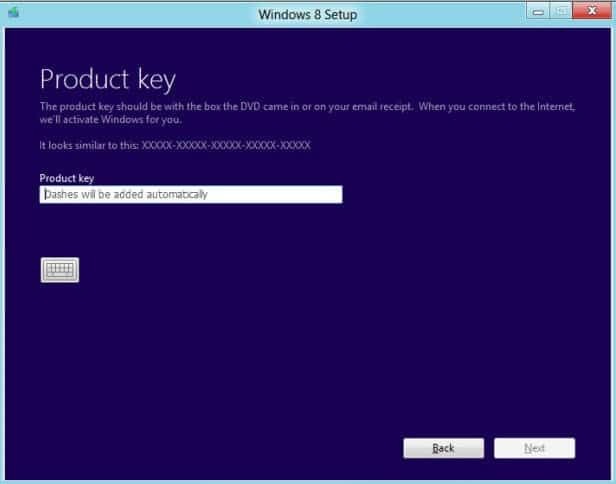 What this means is that the installer will automatically recognize the product key and use it during installation and activation of the Windows 8 operating system. This has several advantages, both for Microsoft and OEMs as it is no longer that easy to "steal" product keys this way, and for users who do not have to worry about fading text or damaged labels on their laptops. One of the improvements Microsoft is making to Activation 3.0 for newly built machines that come preloaded with Windows 8, you won’t have a COA (Certificate of Authenticity) sticker attached to the machine anymore. Instead, this will be embedded in the BIOS. So far so good. There is a slight problem though in regards to installing a different version of the operating system on those devices. Say you have bought a laptop running Windows 8, and have an OEM copy of Windows 8 Pro lying around that you want to install on that laptop. The installer will automatically use the BIOS key during installation giving you no option to enter the retail copy product key during installation. You do end up with an activated copy of the original version of Windows and not the one that you have purchased separately. Something similar was done with Windows 7 and it proved EASIER to enable “pirate” versions of Windows than it was with XP. I’m sure someone will figure out a bypass in due time. It’s already possible to activate using what are called “public KMS” servers although this is a PITA for normal users. With stealing, I meant simply looking at the product key on the laptop and copying it. Right, of course. Will correct it asap. BELARC ADVISOR WILL FIND AND DISPLAY THE WINDOWS 8 PRODUCT KEY FROM THE BIOS. TRY IT, ITS FREE. The BIOS is not hardware – it’s firmware, and a BIOS chip can be modified in some cases, or replaced. Is there a way to get past this? Would the ‘add additional features’ work, in the same way that it does if you want to add the Windows Media Pack Product Key to Win 8 Pro? It isn’t hardware, it’s firmware. Assuming that the BIOS chip is not soldered to the motherboard, it is trivial to change or modify it. If it is soldered, that is what de-soldering tools are made for. Desoldering a BIOS chip isn’t a trivial solution to the problem. And just because you want to run some software, a BIOS license shouldn’t halt you from doing so. Horrible news. Thanks for the warning. The OEM that came with my Win XP computer was so bad that I purchased a boxed version of WinXP, wiped my hard drive, and installed the OS from the new CD. An expensive addition to a new system, but well worth it. The OEM on my laptop, Win7, wasn’t that bad, but if I were forced to purchase a new desktop, I would, once again, purchase a new boxed version of the OS I want to use. Are you telling me that is impossible? OR – would I still be able to wipe the hard drive and then install WIN7? Correction – even if it IS soldered, you may be able to modify it with BIOS flash if one is available – and of course in time one will be. OEM is different to the Boxed Version (apart from licensing rules)? Yes, in fact, the OS that comes with a laptop has slipstreamed proprietary drivers to run things like the touchpad and screen. Unfortunately, a lot of crap and adware is also added. If you know what you are doing, this stuff can be removed in about 30 minutes. If you don’t, you replace your OS and wind up with devices that don’t work properly. I am surprised his machine worked after he installed a generic OS – that was very risky and unnecessary. Can we use SLMGR.VBS command to install another product key and then activate Windows 8 again? I don’t see how you can. The key is in embedded in firmware which means that it would need to be either physically or electrically modified. As I noted previously, in some cases you maybe able to flash the BIOS, and in other cases you may need to replace the BIOS chip. The absolute worst case would be replacing the motherboard, which sounds bad but really is not, and is still a lot cheaper than replacing the entire machine. Solution: Force Microsoft to fix it. They have a duty under contract law to fulfill the contract, and failure to do so entitles you to damages. I am sure they don’t want another class-action suit over this. Fix what ? Nothing is broken. You aren’t making sense. So what happens if your motherboard fails and you have to replace it? Your key is now gone, and the new motherboard may be “new” and without a key embedded. What then? It seems unacceptable that by simply changing out a part in my computer, with an exact replacement even, that I should be punished. And msc545, your responses give no real solutions, disregard the rights of the consumer, make incorrect judgements about the quality of bare OS installations, make false representations about the simplicity of switching out a bios chip, and it appears that you’ve chosen to respond to many comments with the intent of shutting it down without valid answers. > So what happens if your motherboard fails and you have to replace it? You would have to call in to MS and get a verbal authorization. Actually, you can think of this embedded MB code as just a sharper version of what MS has been doing since XP – tying the OS to the hardware. Before it was done in the OS registry, where details about the MB, HDD, OEM, model, and more was buried in encrypted form. According to a formula, these factors were weighed and when the threshold was exceeded one had to make that phone call. Now the code is kept in the hardware itself. MS is clamping down, and significantly, it is doing it with the aid of the OEMs. I would think, though, that a retail upgrade of the OS would override all this, as it always has. Historically, MS has been extremely accommodating when one makes that phone call – if it is even necessary. This whole thing in a non-problem given the number of workarounds and solutions to it. I think that people are becoming alarmed over what amounts to an annoyance at worst. Assuming the Motherboard DID fail, so what ? The VRM is almost uniformly the point of failure, so you pull the BIOS chip and put it in the new motherboard. A five minute problem. I’ve spoken with a Microsoft support man directly about transferring ‘OEM’ (prestinalled by PC manufacturer) Windows for this very problem. His message is actually, no, you cannot transfer the license from one motherboard to another, as it is activated only by/for the firmware installed at the factory. He says the legal contract is not between you (the owner of the system) and Microsoft, but between you and the manufacturer, when you buy one of these PCs. In my situation, they’re HP, who stopped supporting my laptop conveniently after about two years, just as I am beginning to hear that this particular model is not very reliable (Pavilion). Not surprisingly, the Microsoft man suggested I buy retail Windows 10. He said retail Windows is transferable between hardware. Now if I could get HP to activate Windows with a new motherboard for my laptop, I would, but so far it seems they will not even hear requests regarding this model anymore. There is a market of second-hand main boards for these laptops out there, but if what I’m saying is true, then they are worthless to me unless I could reprogram the activation keys. But that is not how things should be. And you obviously are not very technically skilled or knowledgeable. I’ve offered multiple, VERY SIMPLE solutions, and you find them to be problematic. If the situation ever arises for you, please do NOT try to solve the problem yourself. Tech42 you need to understand the EULA Microsoft has laid out for the OS. You are not being punished when you loose the key due to a mother board change as the original license key is null and void with the replacement. The license that came with that laptop or tower cannot be legally used if a major component has been changed as in the mother board. Not saying you cant use the key but if Microsoft pressed the issue they could force you to pay for another license. Desoldering a chip or burning a new one is trivial. I’ve done it many times and so can you. I’m pretty sure most Windows 8 laptops are shipping with UEFI and not BIOS. Martin, are you using the Windows 8 Pro RTM disc from MSDN? Did an ei.cfg to the ISO with your desired edition? Dell has been doing this for years with all versions of Windows. One of the many reasons I like Dell machines, so much easier to manage than other maker’s machines. Well in regards to the last part about using a different key, I think you’d be able to accomplish that once you’re already in Windows. You’ve been able to change your product key within Windows since Vista through “System Properties”. When you upgrade from Win8 to Win8Pro, if you run the setup EXE from the disk it should update the product key in the firmware of the computer. Then you can burn it to a disk and wipe the hard drive if you wish to do so. I can´t imagine any other way of doing Windows upgrades! I think the whole point of MS is to difficult serial piracy (which they do by embedding serials in the BIOS), not avoiding operating system upgrades. I think that the manufacturers will have software that can rewrite the key in teh bios, the same way as they have software that can rewrite a new serial number in the bios. Hope this helps somebody…I bought a new laptop with Win 8 pre-installed.The last 5 digits of the OEM key were visible in control panel/system/View details in windows activation…but I used Belarc advisor to get the full key from wherever it is stored…Belarc was free and I didnt have any issues with it. I wanted Win 8 Pro, so I bought a retail version on sale for $50. I was on the road and didnt want to go through driver installations and chasing down some useful OEM apps, so I installed the Win 8 Pro by merely entering the new key in control panel/system/get more features with a new edition of windows/I already have a product key. I did not need to use the Win 8 pro media: the new key unlocked or downloaded the new features and installed them flawlessly, and now Belarc shows the new pro key as the installed key. I’ve been told by cust svc from ASUS that the bios is not accessible on machines in which Win 8 came preinstalled, only on machines that were upgraded from lower versions. The reason? The time to hit the proper key during boot for bios is 1/4 of a second due to the faster boot of Win 8. A microsoft blog also published the same info. I tried for an hour to access the bios and couldnt do it. I finally ended up using Win 8 settings/advanced startup…..UFEI Firmware settings….that takes me to what appears to be a BIOS setup but almost seems too simple. Maybe not the cleanest way but it works. Good luck! Running that method for upgrade is all good, and when it works it works, when it doesn’t and you’re working on a laptop with recovery partitions which don’t work since the upgrade, you can’t move forward and reinstall as the product key isn’t accepted again, and I can’t take the laptop back to original state and redo the upgrade. This UEFI story is a load of junk. I’m going to adapt my family to Linux, and buy hardware that isn’t MS dependent. Also worth a mention is Asus, producers of some of the best motherboards and laptops available. and redefine family entertainment with Windows Media Center. Networks whenever they have access, however many locations now offer free Wi-Fi meaning a fast connection is often available. The computers which are member of Home – Group will appear in Windows Explorer. My question is, do I need a Windows 8 SL English to install it in the laptop? Does anyone out there see any solutions to REMOVING the product key from the BIOS? If it can be replaced by a clean install then there should be a powershell or other type of command to delete the objects from the BIOS. Please post any if you found a solution. M$ always makes things more and more complicated for it’s users. To have the license key in the Firmware of the BIOS seams appealing but useless in point of security. Firmware can be altered and so the Windows software which reads the license key. WAT Remover should be prove enough. I have seen companies using sophisticated hardware keys and failed miserably in protecting there software from crackers. Only what was needed was a hardware emulator which creates what needed or replaces everything to get things going. In point of copy protection, it’s useless to have the License key in the BIOS. It will not prevent piracy. As mentioned, what happens if you like to upgrade from a home edition to a pro? Most likely you will end up wasting quite some time in calling M$ to get it installed and running. I never liked Windows and I never will, so I do not use it. I’m a happy Linux user since over 15 Years. I just don’t like jailed environments like Windows and Mac OS X. Some people seam to love to be prisoners of corporations. I do not! I like to tweak, modify and have control over that what I use. There is nothing better than a community of great people which work together to have a good, free, and open system and user environment. Computer crashed ran ASUS recovery now the product KEY is not recognized Called Microsoft they would not provide help, Called ASUS they would not provide help. Now I have to purchase a new version of Windows or Computer I am done with Both Microsoft and ASUS products. You don’t need to do that. There are Win8 keys that you use during the reinstall process. PC repair guy said no problem we just replace the bios chip with a compatible one, no sooner said then done, problem is the laptop came out with “windows 8.1 enterprise” and now when I load it I get “windows 8.1”, and I know the bios chip he installed is from the same make and model as mine, but I now have none of the features of Pro or enterprise, and even when I try to upgrade with a genuine 8.1 enterprise disc or key it fails…. am I doing something wrong, never had this problem with my other older laptops, or is the embedded bios code messing me around? Trash the HD and the Dell OS DVD will not work. There was no key in BIOS or UEFI that the Dell OS Reinstallation DVD that came with the PC can find. 100’s of PC and ZERO, not one, could reload the OS on to blank HD with this so called magical key in the BIOS/UEFI. Every PC we use was in my hands I ran the DVD’s that came with them and not one could get past the product key screen. They all want the key entered. I image them and move on. Windows is garbage in any form. Windows 10 is the OS for idiots.